After multiple quarters of beating expectations, Amgen, Inc. (NASDAQ:AMGN) shocked the market by missing both quarterly and annual estimates. Both revenues and earnings came in well below expectations, indicating the company is stuck in neutral. New drugs in the pipeline may compensate for the revenue declines in older drugs. However, with this earnings miss and with more revenue and earnings stagnation predicted for the foreseeable future, AMGN stock appears to offer little to new investors. The company reported earnings per share (EPS) of $2.89 on $5.8 billion in revenue for 4Q 2016. These numbers sent the stock reeling during after-hours trading as analysts had expected $3.03 in EPS on $5.83 billion in revenue. The revenue number also represents a drop-off from 4Q 2016 when AMGN reported revenues of $5.95 billion. Earnings remained flat on a year-over-year basis as the company also earned $2.89 per share in 4Q 2016. Full-year revenues came in at $22.8 billion, missing estimates and falling short of 2016 revenue levels by 1%. EPS also missed expectations for 2017 as earnings came in at $12.58 per share. For all of 2017, it had forecasted $12.70 per share on $22.89 billion in revenue. The company reported free cash flow increased by 9% to $10.5 billion. Increases in operating margins, as well as higher interest income and changes in working capital, helped improve that cash flow. The Thousand Oaks, Calif.-based biopharmaceutical giant is the world’s largest independent biotech company. Amgen is best known for producing products such as Neulasta and Enbrel. Still, as those products attract competitors, they become a less significant share of company revenues. Most analysts expect drugs such as Kyprolis, Prolia, Blincyto and Vectibix to pick up the slack. Sales of its recently approved cardiovascular drug called Repatha should also improve. In December, Amgen gained approval to market Repatha as a drug that reduces the risk of heart attacks and strokes. However, drivers for that future growth remain unclear. For revenue, AMGN provided guidance of $21.8-$22.8 billion. Hence, the company’s numbers project 0% revenue growth as the best-case scenario. On EPS, the company offered guidance of $12.60-$13.70 per share, leaving it unclear whether AMGN will enjoy EPS growth for 2018. Over the last five years, the company had increased EPS by double digits in four of the last five years. Unfortunately for current owners of AMGN stock, the profit growth appears to have stopped. Its new drugs will make up for the declining profits of its older drugs. Still, analysts forecast earnings to fall back below 2017 levels in 2020. Analysts expect peers such as Johnson & Johnson (NYSE:JNJ), Novartis AG (ADR) (NYSE:NVS), Merck & Co., Inc. (NYSE:MRK) and Sanofi SA (ADR) (NYSE:SNY) to continue increasing profits. Valuation also offers little incentive to invest. The price-to-earnings (PE) ratio stands at about 17. While few would call a 17 PE expensive, that valuation will likely not attract bargain hunters to a no-growth stock. Also, most of Amgen’s peers who enjoy continued profit growth trade at a similar valuation. One bright spot for the company remains its dividend. Since paying its first dividend in 2011, AMGN stock owners have seen increases every year. Within six years, annual dividends have risen from 56 cents per share to $5.28 per share last year. With a yield of around 2.5%, it provides stockholders with a respectable cash return. Still, if predictions of stagnant profit growth hold, one has to assume the dividend increases will slow down, if not stop altogether. With the latest earnings report confirming the earnings stagnation that analysts had predicted, investors are best off avoiding AMGN stock. In a departure from previous quarters, the company missed quarterly and annual EPS and revenue expectations by a wide margin. A decline in revenues, as well as 0% year-over-year growth, had investors selling following the report. 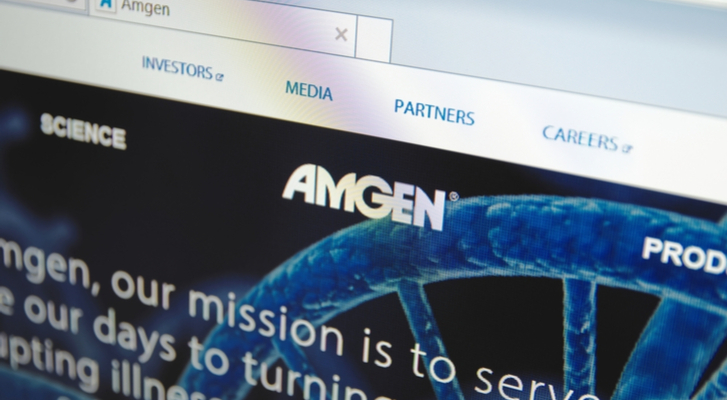 Several new drugs have appeared in Amgen’s pipeline. Still, most expect those products to only sell well enough to make up for declining profits from older drugs. Long-term AMGN investors have some incentive to stay in due to its dividend. However, for new investors who want to profit from this industry, they should pass on AMGN stock. Article printed from InvestorPlace Media, https://investorplace.com/2018/02/earnings-miss-ushers-in-era-of-stagnation-for-amgen-stock/.